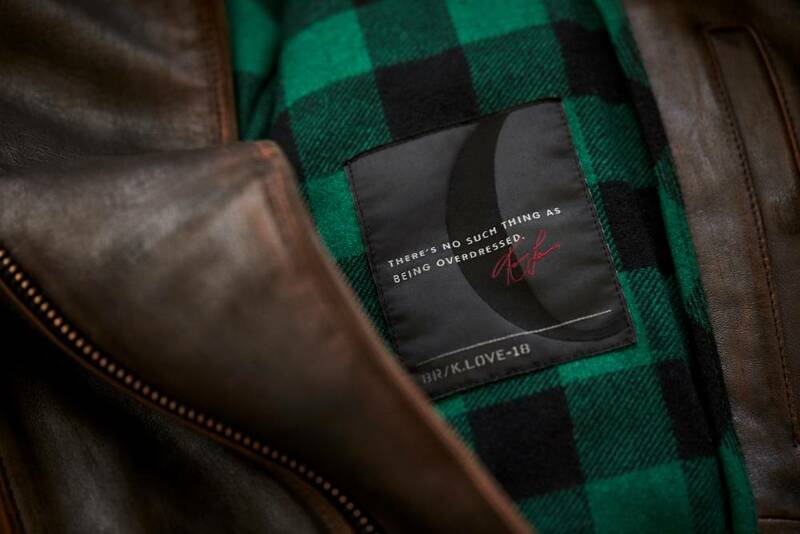 After being our brand ambassador for 4 years, it only seemed fitting that pro basketball player Kevin Love should design an exclusive collection of his own, just for us. 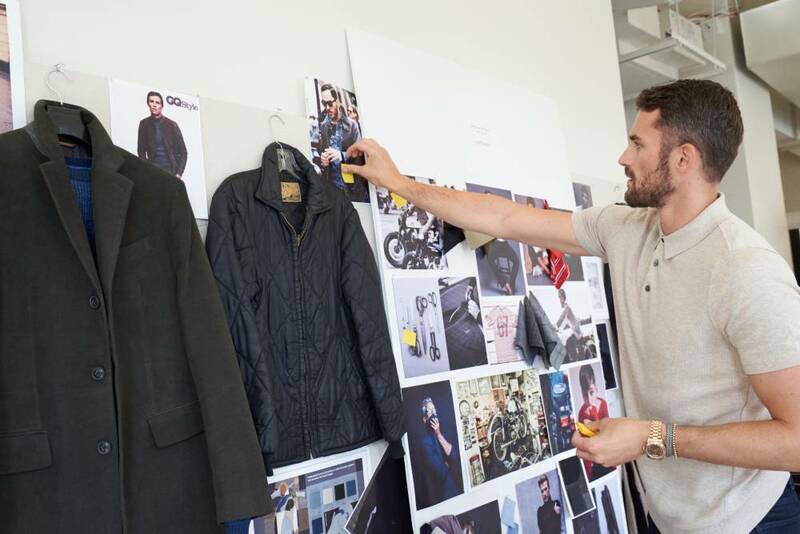 To celebrate the launch of the collab, BR/K.LOVE-18, we got a firsthand account of the design process, the similarities between basketball and fashion design and the game-changing styles straight from the man himself, Kevin Love. BR: We are so excited to partner with you on this collaboration. What are the influences and inspirations behind BR/K.LOVE-18? I was inspired by an array of my interests. This included my hometown Portland, Oregon, my love for classic films, old Hollywood style, photography and my belief that fashion should be timeless. Also, my inherent love for great outerwear was definitely very prevalent throughout the process. BR: You were very involved in the design process. How does it compare to life on the court? The notion of a collaboration is so ingrained in my own profession—working with a team of talented creatives who bring so many diverse elements to the table—well that IS a team sport. The BR Men’s Design Team and I were in lockstep throughout and it was awesome to learn from them, but also, make sure that my vision was brought to life. They were the best to work with! BR: If you could sum up the collection in three words what would they be? Timeless, athletic and rugged. Bonus: Renaissance man. BR: We love that there is a mix of themes throughout the collection. Was that intentional? Absolutely! All of those categories really fit the nature of how I get dressed. I wanted the collection to reflect all aspects of my personal style sensibility and have clothes that everyone can relate to, are staples, but can be mixed and matched to create something fresh and new. BR: At BR, our fabrics are the treasures. We know fabrics are important to you too. Tell us a little about how you selected the materials in the collection. Any favorites? The archive room! All of the old school military pants and ’70s leather jackets. That’s when my wheels started turning. Being in the design studio was also inspiring. We were surrounded by fabrics, vintage clothing, mood boards—all of these things that remind me why I love fashion. Also, I love that BR focuses so heavily on performance fabric. 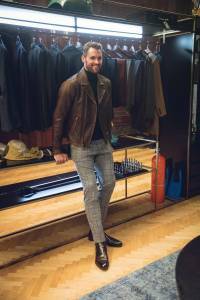 Having suiting and trousers that are breathable and movable is so important to me. Comfort is key—plus, with travel being so much a part of my life, those fabrics make it easy to pack. BR: There are a lot of outdoorsy influences in the collection. How did you elevate these typically casual styles? Growing up in Oregon, wearing functional warm layers was what you had to every day. That approach to style really influences how I get dressed—I definitely wanted that to be reflected in the collection. With BR/K.LOVE-18, we’ve taken traditional fall menswear and added my spin. 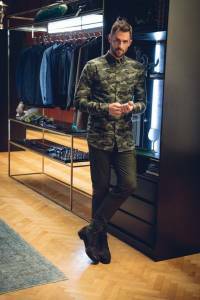 For example, an olive raincoat with camo lining, buffalo plaid-lined leather or a classic cargo pant crafted from suiting fabric with tuxedo tabs. Merging the rugged style of the Northwest with elevated tailoring defined the design process. Those little details really personalize the clothes. BR: Your love for old Hollywood style came through nicely. What old Hollywood star could you see wearing BR/K.LOVE-18? BR: You have an affinity for vintage varsity pieces. How is that reflected in the collection? The varsity jacket is probably one of my favorite pieces in the collection. It’s a wardrobe staple in my opinion. Also, we included details in a lot of the knits that gave certain styles a little bit of that classic varsity touch, like the two stripes on the varsity sweater. BR: Which pieces were most important for you to have in the collection? I feel like I’ve already shown how some of my favorite pieces really embody my personal style and those are the varsity jacket, the leather moto jacket and the cargo pants. All of them are classic pieces but with my twist and made to be comfortable. BR: We have to ask about the ‘Who is Kevin Love?’ videos—which are amazing! For someone who hasn’t seen them yet, how would you sum them up? I really viewed this collection as an embodiment of all my interests and the ‘Who Is Kevin Love?’ videos are the same. With those, you get a sense of my quirky personality and interests— battling Lindsey Vonn in downhill skiing, music with Questlove and food with Marcus Samuelsson. Sport, music, and food are pretty much my top three priorities in life (well wine, too) so this is a window into those interests but in a fun way. Ready to see the collab? Watch the video below for a BTS look, then shop BR/K.LOVE-18.